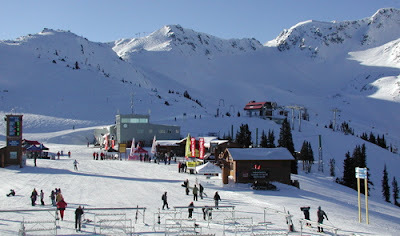 Whistler Blackcomb. Photo by Sue Frause. A week after the official end of summer, Whistler Blackcomb received its second dusting of snow. Up to 30cm (almost a foot) of snow fell in the alpine on Saturday night and the snow line made its way to the valley. Another 18cm (7") of snow was expected in the next 24 hours with more forecast throughout the week. Weather experts say the upcoming winter will likely be a La Niña year, which is good news for Whistler Blackcomb. Traditionally, La Niña calls for wetter and colder than normal weather in the Pacific Northwest during the fall and early winter. On average, Whistler Blackcomb receives 33.5 feet of snow a year. Last year Whistler Blackcomb received over 46 feet of snow. To give Mother Nature a boost, Whistler Blackcomb is currently putting its snow guns into place, ready to be fired up early next week. Live footage of the mountains can been viewed on the Whistler Blackcomb webcams.